Bushes pruned into various ornamental shapes are known as topiaries. 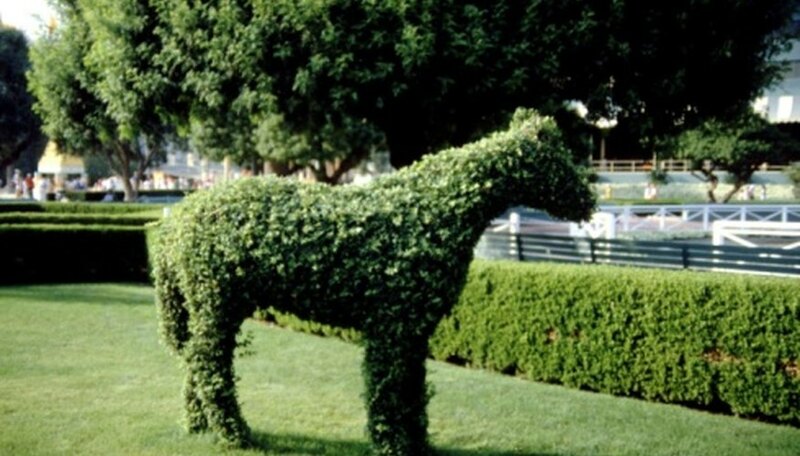 One type of shape that you can prune your bushes into is animal shapes. However, there are almost endless different animal shapes that you can choose from, including domestic animals, farm animals and exotic creatures. If you have decided that you’d like to give topiary a try, then you may want to have a few practice bushes. It can be a little tough to get the hang of, but once you do, you’ll be pruning animal shapes like a pro. Prune only about 30 percent of the bush to create the animal shape. Pruning any more can harm the bush. Try to cut only thin stems and leaves. Do not start cutting away at thicker stems unless you have to. This ensures the health of the bush. Make cuts to thicker branches angled downward, away from the base of the bush, using hand held trimmers. This type of cut is healthier for the bush. Draw the animal shape that you want to cut. Try to keep the shape as simple as possible and choose an animal with distinctive features so it’s clearer what it is. For example, a zebra can end up looking just like a dog, but an elephant is much harder to mistake. Bend garden wire into the animal shape that you want to prune in the bush. Make the animal large sized out of the wire. Then, as you prune, use the wire as a guide for shapes and dimensions. For example, the wire can be bent into the rounded back of an elephant. Put both ends of the wire in the dirt to keep it in place, with the wire pressing against the bush as you prune as a guide and to help you achieve the rounded appearance. Use a yard stick to guide you as you prune the animal shapes into the bushes. The yard stick can help you accomplish straight lines. To create animal shapes that have even more dimensions, you will need wire cutters to entwine multiple wires together so that you can create a shapes that completely circles the plant. If that is too tricky, you can purchase predesigned wire animal shapes that are sold at some home and garden stores.